I’m currently conducting research at Erasmus Medical Centre (Erasmus MC), in Rotterdam, the Netherlands, as part of an international collaboration which includes Dutch and Canadian scientists. I’m working with Dr. Patrick Forbes (Erasmus MC, a former postdoctoral fellow at the UBC School of Kinesiology), Prof. Maarten Frens (Erasmus MC), and Prof. Jean-Sébastien Blouin (UBC Kinesiology). My current projects entail gravity-related experiments in which we will test human behaviour in altered gravity conditions on parabolic flights. These studies will be conducted in partnership with two parabolic flight campaigns organized and operated by the European Space Agency (ESA). 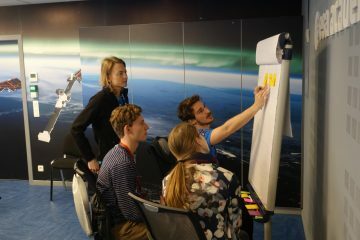 I’m a co-coordinator of a research team at Erasmus University Medical Centre (Erasmus MC) in Rotterdam, The Netherlands, who have been selected to participate in ESA’s upcoming parabolic flight campaign (IPFC). In this campaign, experimenters will be provided with normal (1g), hyper (1.8g) and partial (0.25, 0.5, 0.75g) gravity environments through parabolic maneuvers onboard the Novespace Airbus A310 ZERO-G. The objectives of this campaign are to 1) further scientific knowledge of the influence altered gravity levels have on life processes and 2) improve the preparation for future human exploration missions. The campaign includes research teams from a variety of different universities and institutes across Europe and is scheduled to take place May 28th – June 8th, 2018 in Bordeaux, France. My team is investigating how the brain adapts eye movement control when faced with novel gravity signals. We will be measuring the eye movements of human participants during different levels of gravity while providing vestibular stimulation. I’m also part of a student team at Erasmus MC who have been selected to participate in the Fly Your Thesis! 2018 parabolic flight campaign, organized and sponsored by the ESA Education Office. The Fly Your Thesis! (FYT) programme gives master and PhD candidates the opportunity to fly their scientific experiment or technological research in microgravity conditions. Our team, G-REACH, were one of two teams selected for this year’s campaign. In this campaign, experimenters will be provided with normal (1g), hyper (1.8g) and micro (0g) gravity environments through parabolic maneuvers onboard the Novespace Airbus A310 ZERO-G. The campaign is scheduled to take place October 22nd – November 2nd, 2018 in Bordeaux, France. We are investigating how the brain combines different sensory information in microgravity environments to perform motor tasks. Specifically, team G-REACH will study how humans detect errors and adapt upper limb reaching movements without the presence of normal gravitational cues. Hear from other KIN Students , both current and alumni!